The cemetery access road looks like a driveway, and is listed as an abandoned county road. On its east side is a mobile home on a concrete slab. The access road is across the street from, and just west of, CR 909, Shore Drive. This cemetery is not visible from CR 733 or from the access road and bridge. This was once the community of Eureka. It was where the East Fork and Eureka Lake came together. William Marshall Lee operated a ferry across the East Fork on Eureka Lake. The first toll road was Lee's Toll Road, which went from Rockwall to Clarksville. Toll was 10¢ for a man on a horse and 25¢ for a 2-horse vehicle. In its hey-day Eureka had Methodist and Baptist church services, as well as rowdy brawls in the saloon. A road was built from Eureka to Wylie that was made of large stones. The name became Touchstone Road. The cemetery was part of Shiloh Baptist Church, which was started in 1890. In 1960, the church moved to Brown Street in Wylie. The cemetery has been neglected since the move. The deed for the church is listed in Vol 99, p 258. The cemetery is not mentioned. The church was in the approximate location of the trailer house. When the church moved, they quit paying taxes on the property. Descendants of the previous owners reclaimed the land and sold the church portion. The cemetery covers about 1 acre of land and is supposed to be full. COLLIN COUNTY CEMETERY INSCRIPTIONS I lists about 12 graves. There should be a couple hundred. I have compiled a list of as many names as is known of people buried in the cemetery, about 55. No one kept records for the cemetery. Like many country cemeteries, people did not buy lots to be buried here. They just dug a grave when one was needed. If they dug into another grave, they just moved over a few feet. There are a couple of fenced areas in the cemetery. There is a chain-link fence around a lone grave near the entrance to the cemetery. No stone is inside the fence. There is a wire-fence area on the north side of the cemetery. It is large enough to hold about 8 graves. Again there are no stones inside the fence. There was another fenced area on the southeast. The fence was taken down when the Sheriff's Department cleaned the cemetery. It contained the graves of the Hansells. There are irises planted around the site. 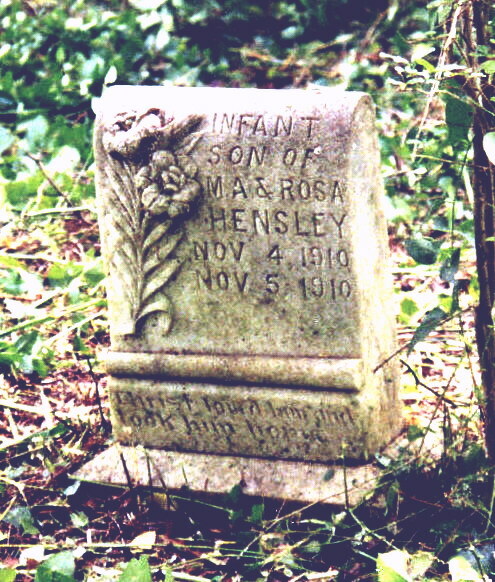 The most recent grave is for Rosie Hensley, buried in 1963. She still has children living in Wylie. There is a large Hensley plot on the southwest part of the cemetery. It is marked by large cedar trees. There are several large cedar and pecan trees in the cemetery. At one time the cemetery contained several tall stones and several bois d'arc markers. The county bridge washed out and the county did not replace it. The remains of the bridge can be seen east of the present bridge. The previous property owner built the bridge over the creek. His deed did not mention access to the cemetery. However, the deed of the land with the concrete slab south of the cemetery does mention that there should be access to the cemetery. The owners of the bridge and land will let people have access, but they would like to be told that people are there. 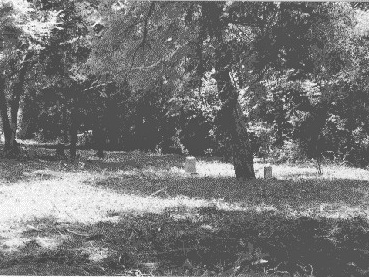 In June/July 1993, this cemetery was cleaned by the Sheriff's Department. Only about ½ dozen stones were found. Most were down. The man that owns the adjacent property says that he will keep the cemetery mowed. In 1995 he asked for help in maintaining the cemetery. Weep not: He is at rest. Died the same day as his brother, J. B. B.
Hansell Alma daughter of S. B. and M. E.
Hansell Viola daughter of S. B. and M. E.
For I am waiting in Heaven for thee. Harris Cynthia H. wife of T .H. And that with Christ she's gone to reign. Christ loved him and took him home. M. A. 1889 - 1957 joint stone with Rosie L.
1884 - 1963 joint stone with M. A.
Hensley Sarah E. wife of M. H.
Holt C. J. infant daughter of J. G. and G A.
Holt G. A. son of J. G. and G. A. King Jeffie M. son of W H. and M. L.
King Mary L. wife of W. H.
Massey infant daughter of A T. and M. S.
Wells Charley son of Rev. G. M.